Welcome to another installment of Carrie's "Marketing Monday," where I take a recent real-life experience and then analyze the pros and cons in a mini case study format, kind of the size of a silver dollar pancake, now that I think about it. So here goes the IHOP experience, and please feel free to chime in with your comments at the end of this post if any of this resonates with you. So, this all started because we wanted pancakes this weekend. We had wanted them last weekend, and the weekend before that, but a combination of intense rain causing cabin fever on Saturday, plus being really hungry when we woke up, plus me realizing that the last time I tried to cook pancakes resulted in an alarming amount of smoke in the kitchen, made the trip rather urgent. The dining in experience at IHOP was great. Our waiter was friendly and served the food quickly, and even served up a free hot chocolate refill. After all that, I ended up getting whole wheat french toast, but I tasted Mr. P's blueberry pancakes, and they were light and fluffy, as was my french toast. The menu had a wide variety of choices and included the calories for each dish, which made me feel like I'd gained 20 pounds from merely reading the description of some of the heavier fare. How could a cafe mocha be like 300 calories? However, there is a new Fit menu recently introduced,(dietician-approved) with a lot of meals like mine weighing in at about 500 calories, and instructions on how to ask for substitutions, leave out the butter, sugar, etc. There was a well advertised promotion where you get $5 off with a $25 gift card, and that also worked for us, when we -- like -- did the math. We were also pleased that our receipt allowed us a free meal next time for filling out the online survey, which I did when we got home. Good survey questions, although routine. and monitor their community more closely. Once back home, I checked out IHOP's Facebook page, and was pleasantly surprised to see that if I signed up for their E-Club, (nice alias for newsletter), I would receive a free meal just for signing up, and on my birthday, and on my anniversary of signing up. OK, that worked for me, and totally confirmed that customized tabs are where it's at if you want to get anywhere with your FAN page. Their page showed an impressive 200,000 + Fans, with moderate participation and a few scary updates (I'll get to that next.) I liked that the customized tabs were used well, with tabs for restaurant location, photos, videos, and "Festival of Flavors," which links to their home page and fall menu specials. Naturally, I checked out the home page, and appreciated the cute dog chasing a pile of leaves animation, which turns out is a preview of their "Catch a Leaf" game. I was also pleased to see a video on the home page, and the "Catch a Leaf" game was fun. You get points for helping a character get the leaves in his bag, and at the end can post your score to Twitter or Facebook. Big social media points there. The site also gets points for a "Social Responsibility" nav bar, although I wasn't sure what that meant once I got there and there was only one paragraph of text. The website also gets points for having a News section divided into 5 subareas, (media only, online press kit, press releases, etc. ), although these might have been combined to make it more concise. IHOP's Catch a Leaf Game gives users the option of posting their scores on Twitter and Facebook, although they have no Twitter profile set up yet. *I was a little confused that there was no Twitter link on IHOP's home page, given that their leaf game offered you a tweet to post the score, but I assume this is a conscious decision on their part. 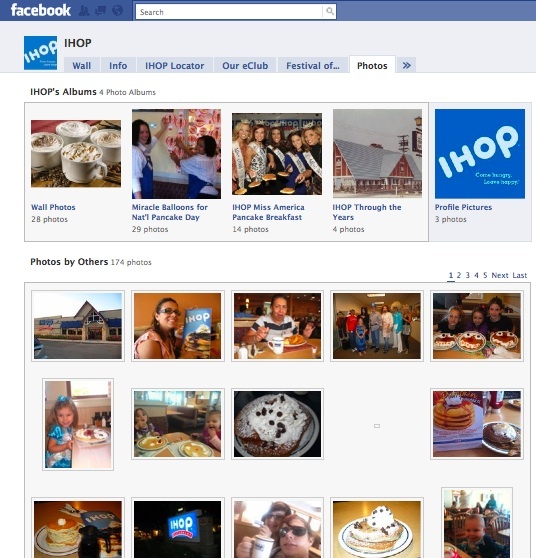 I happened to find an interesting post on the marketing site ClickZ, that highlights how IHOP was a top trending topic on Twitter last February, without even having an account! I believe this was related to National Pancake Day. 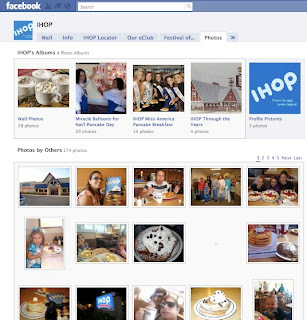 Posted on that site is a quote from IHOP: "At this point it's just not been part of our strategy to have a Twitter feed," Jennifer Pendergrass, IHOP manager of communications, said. "We are just kind of still testing the waters as far as getting a feel for social media. We are on Facebook right now." Good enough, but I don't think it would be a giant leap for them to have a Twitter profile at this point, given the extent of their social media on other platforms. *That brings us to the Facebook page. While the customized tabs are effective, updates are only posted every 1-2 weeks, which in my view is not frequent enough. Also, they need more monitoring of their page. A quick glance revealed a cluster of unhappy customers with concerns ranging from their servers, to the quality of the food, to coupon issues, with no response from IHOP. And yet, scrolling further down, a thorough response to an inquiry about kids menus. *On the home page, while I liked that there was a video, once I played it, it felt more like a commercial on not particularly creative. I wanted to see something unique. Speaking of video, I was a little surprised to see only 4 videos posted. This seemed meager for a national chain. "Come Hungry, Leave Happy." I like this, it's simple, direct, and upbeat. By contrast, "The Pancake Revolution- Bring Pancakes to the People," that appear to be the sign-up theme, seems a bit gritty and dark. While I appreciate a coupon or a discount, I personally don't perceive pancakes as a luxury anyway, so I wasn't quite sure what was intended with this theme. While I liked the idea of "Festival of Flavors," it didn't really suggest breakfast food or autumn to me, but more of a "fiesta" feeling. Wrong season? So, that's my wrap up for now. Have to run because I'm kinda hungry for ...OK, I'll just say it...more pancakes. Thoughts? Any other restaurants you feel do a great marketing job?